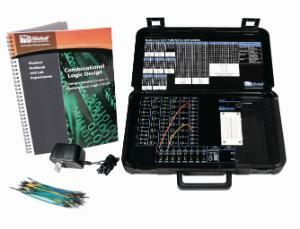 Students can go right to work with this independent trainer that has eliminated the need to discreetly wire ICs. The attractive and easy to use system draws students in to the beauty of digital logic and embedded systems design. Eleven hands-on labs are included in the introductory digital logic course, complete with lab manual authored by a university professor.Students can create more than a dozen standard logic circuits and custom circuits using standard TTL logic, and the expandable breadboard allows the system to grow as students' knowledge increases. Kit includes 100 machined pin hookup wires, a 9V wall adapter, gate elements, expandable breadboard and a rugged carrying case with commonly-referenced truth table inside the case lid.